Mike Smylie, owner of Smylie Brothers Brewing Company, addresses the crowd at a panel discussion on sustainability and brewing. 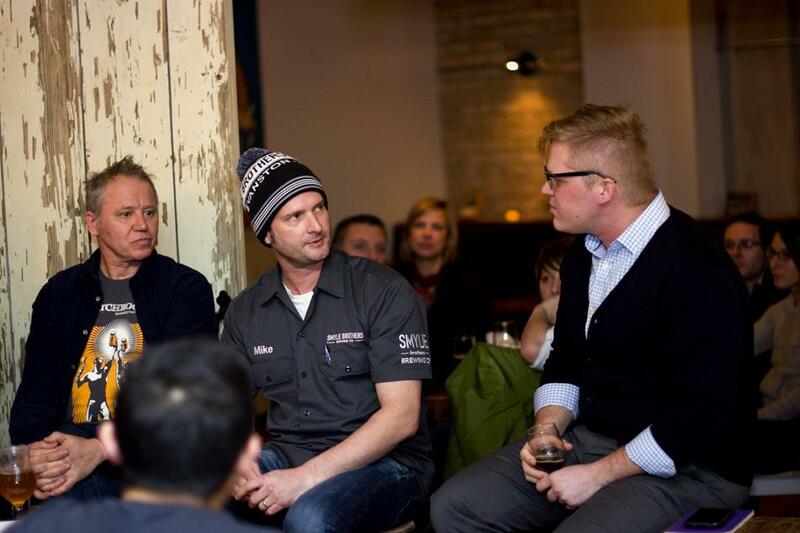 Five Evanston brewers gathered for the event, which touched on the social and economic issues that contribute to a business’ sustainability practices. Staff from four local breweries spoke at a panel discussion Tuesday night about the intersection of brewing and sustainability. Citizens’ Greener Evanston, Farmhouse Evanston, NU Sustainable Food Talks and Sketchbook Brewing Company sponsored the event, which is part of six different events NU Food Talks will hold throughout the year, said Tiffany Leighton Ozmina, the administrative coordinator at the Chemistry of Life Processes Institute at Northwestern. The event was held at Farmhouse, 703 Church St., and about 40 people attended. The discussion featured brewers from Smylie Brothers Brewing Company, Temperance Beer Company, Peckish Pig and Sketchbook, all of which are based in Evanston. “I think it’s really cool how well these guys know each other and how even though it ostensibly seems like they’re vying for the very similar market share in Evanston, they’re very collegial and very collaborative,” Rory Nicholson, a member of the board of directors for CGE and the host of the event told The Daily. The brewers touched on a variety of topics throughout the night with an emphasis on the sustainable practices they employ. Decker also said all of Sketchbook’s containers are reusable and recyclable, which cuts down on waste, a big issue all the breweries faced. Another source of waste the brewers touched on was that of spent grain, which they cannot use once it has gone through the brewing process. Several of the brewers said they found alternative ways to use the grain. Peckish Pig’s Tom Fogarty said he gives the grain to bakeries or works with Eagle Scouts so they can use it for projects. Smylie Brothers’ Mike Smylie said he gives away his grain as a way to feed animals. While all of the brewers celebrated the more elaborate practices they employ, they also highlighted the importance of the little things they do to stay environmentally friendly. Although the brewers all said they do as much as they can to stay sustainable, they emphasized how individuals can make the biggest differences. Correction: An earlier version of this article misstated what Mike Smylie does with his grain after using it for brewing. Smylie gives the grain away for free to feed animals. The Daily regrets the error.